When I first heard the phrase "sound bath," I envisioned being submerged underwater in a tub that women have water births in. I was quick to find out that’s not they are whatsoever. 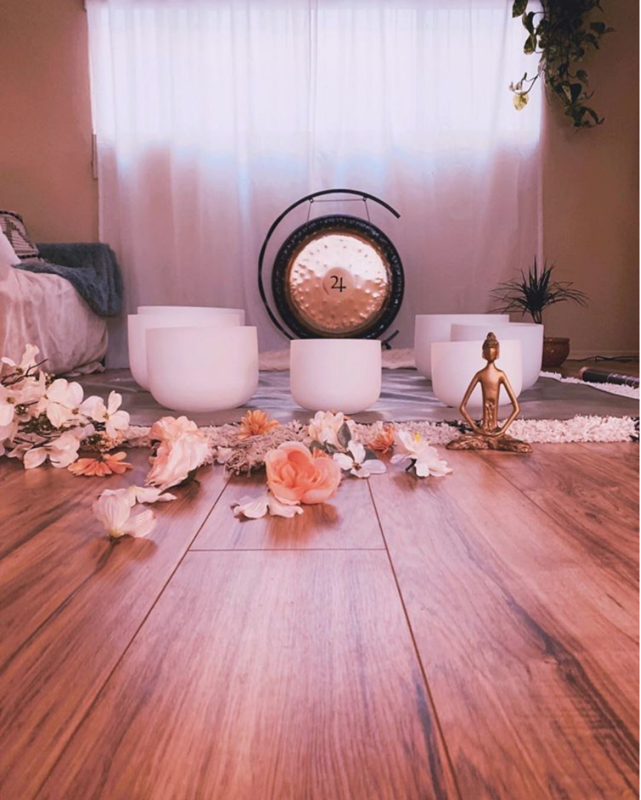 Alternatively to my first impression, sound baths are ancient sound-healing practices dating back to more than 40,000 years ago that Tibetan, Aboriginal, Greek and Egyptian cultures utilized. To put it simply, a sound bath is a meditative journey that can take you deep within from sound created. The sounds are typically created by instruments such as Tibetan Singing Bowls, Gongs, Shamanic Drums, Koshi chimes and vocals. The sound frequencies created help alter the states of our brainwaves. The normal state of the brain is in Beta, but when it moves downward two states to Theta, it brings your brain into a dream-like state. So many people stay in the fight or flight state of mind, not giving our brains a chance to relax and release. These frequencies in the Theta state will allow our frequency to vibrate higher in order to promote inner healing. Interesting… so, in other words, noises can help humans heal? Innovative scholar Nikola Tesla was once quoted saying, “If you want to find the secrets to the universe, think in terms of energy, frequency and vibration.” The universe is made up of vibrations. Our bodies are made up of vibrations. The speed of sound in pure water is 1,498 meters per second, as compared to 343 meters per second in air at room temperature and pressure. With that being said, sound travels faster through water. As human beings, we are made up of about 70% water. This makes sense why sound healing practices are so effective. While I underwent my first experience attending a sound bath, I was not sure what to expect going into the class. I’ve always enjoyed yoga and I was looking at the schedule for Yoga NOHO and saw a breath work and sound bath combo. I signed up for the class, choosing to keep an open mind. After looking into some suggestions, I decided to come prepared and bring my yoga mat and water. I got there early. I learned most people taking the style of sound bath I like to attend usually bring a blanket with them as well. This way, you can wrap yourself into a cocoon on top of your yoga mat and feel as comfortable as possible. I also now bring an eye mask, just so I can go into that deep state without any light peaking in. Some people also bring their crystals, if that is your type of thing. Please note sound baths have no affiliation with religions nor are they considered to be a ritualistic practice. You are simply being guided to a deep, meditative and clear state with sound frequencies. The lights are turned off but the room has a soft glow to it from all of the Himalayan salt lamps that are lit. The room has an aroma of essential oil and a bit of sage. The class I like to attend is put on by two lovely ladies, Shanila and Gina. You can feel the love and kindness that oozes from their souls. They begin the class with intention talk, allowing you in your own head to clarify what your focus on healing is. If you have nothing specific, it’s great to just keep an open mind and let emotions come and go as they please. To get the class started, we begin with a 3-part breath work practice coming deep from the belly. This type of breathing can help stimulate the mind, body and spirit. This allows our bodies to receive more oxygen, resulting in the better circulation of feel-good chemicals. This helps allow us to become more open. There is music playing during the breath work. You may even start to feel your body getting hot and tingly as you continue on for a few minutes. Before going back to your regular breath, they encourage you to scream on the count of 4. The first class I attended was quite intimate, maybe 5 or 6 people. At first, everyone was kind of quiet, no one wanting to scream out of their comfort zone, myself included. (That ego type sh*t.) They do a few cycles of this intentional yelling. People eventually become a bit more comfortable yelling. By my third or fourth class, I was probably the loudest one screaming in the room. I can say from my own experience; the release of stagnant emotions in your body feels so damn GOOD! Following the breath work is the sound bath. You are still laying in your cocoon, with your eyes closed. You begin going back to your regular breathing pace. The crystal singing bowls then dominate the room. They are tuned to 432hz, which is known to be the “miracle” tone that activates important parts of our nervous system. All different noises and frequencies, even ocean waves may be part of your experience. At one point, affirmations are read aloud by either Shanila or Gina. This part gets deep. I start crying every time. My first class I was so thankful for the eye mask. I was sobbing like a baby. I felt myself in a very euphoric state of mind, releasing a lot of built up energies inside. I felt them pouring out of me. I wasn’t sure if anyone else had that type of reaction, but I know it felt good. The second class I attended was one of the most eye opening experiences. There were about 30 people in this class, everyone was a lot closer than my first class. During the process, on top of myself, I heard so many others crying, like snot-type cry (maybe bring tissues if you feel you have a lot to release haha). People were screaming when were were given the opportunity to yell, and no one gave an F. We were all laughing after the screaming, as if to acknowledge, "look at us crazy strangers wrapped in blankets screaming out the stresses of life together!!!!!" But it showed me some thing important. It showed me that all of us are going through this life thing. Everyone is going through something when you go past the surface. There were men and women of all ages in the room, sharing this space and time together. No one was immune to this emotional release. It was at this time, I felt such a connection to the human collective. We are all divine spirits put onto this earth in a physical body. We are all equal and we should all spread a little more love on a daily basis. In conclusion, I am really thankful to have integrated the sound bath practice into my life. Every time I walk out of my class, I find myself in a different realm or mindset, and a positive one at that. I feel lighter. I feel this riddance of any built-up negative energy that was chilling in my body making a home where it doesn’t belong. I see clearer. As humans with really complex and filled brains, it is important to recharge and allow your mind to go to a clearer state. How can you keep going at optimum level if you don’t clear out the mental garbage regularly? It’s like continuously filling a trash can--at some point it’s just gonna topple over and I know I sure as hell don’t want to touch old, wet food on my floor. This is a metaphor for a mental breakdown reminding us to clear our emotions out. Don’t let things stay longer than they should. I arrive early every time so I am able to grab a good spot in the room and allow myself to calm my breath from life before we get started. It allows me to go to a deeper relaxed state when we begin. I drink a lot of water beforehand, as well as bring a water bottle with me. Sounds travel faster in water, so the more hydrated you are, the more likely the frequencies will be absorbed by your cells. Be open; allow yourself to go through the motions. Don’t fear being vulnerable in an open and safe space. Be good to yourself and don’t resist the release. Last but not least, I know sound baths aren't typically done in a real “bath” per se, but I am so guilty of putting sound baths on YouTube while I take a real bath. Adding the water element is a MUST TRY. Add some Epsom salt and light some candles. This will help you to go straight your own personal zen right at home, as that is one of the best places to do it! I am all for bettering myself as a human being and shedding any behavior or belief that doesn’t serve the greater good. I am open to trying new things to bring out of the best of myself. We only have one life and I want to live it in the most open, loving and abundant space possible.